A 13800V/4160 V transformer has five taps on the primary winding giving -5%, -2 1/2 %, nominal, +2 1/2 % and +5 % turns. If, on-load, the secondary voltage reduces to 4050 V then, which tap, should be used to maintain 4160 V on-load (assuming the supply voltage remains constant)? To keep the secondary voltage at (or as close as possible to) 4160 V, either primary supply voltage or the HV winding tap position must be altered. V1/V2 = N1/N2 or V1·N2 = V2·N1 indicates that, to keep the equation in balance with primary voltage and secondary winding turns fixed, either V2 or N1 must be adjusted. Since the objective is to raise V2 back to nominal, then N1 must be reduced. Therefore N1 must be reduced by (1 – 0.974) = 0.026 or 2.6 %. Reducing N1 by 2.6 % will accomplish the increase in secondary voltage output. The nearest tap to select is -2 1/2% (see Figure 1). How are setting of the OLTC output voltage? in 33kV/433V tranformer if secondary voltage reduce from 433V to 405V ,Any consumption reduce . You need to reduce your tap by 6.46%, nearest tap is at -7.5%. Taps on HV winding are provided for variation of HV volts. It may not be good practice to change the taps for reduced LV volts. Though , the extent to which the variation is proposed is Ok. The transformer should be designed suitable for variation of LV volts with taps on HV. Kazim, the ratio of secondary windings to primary windings needs to increase by 1.027. 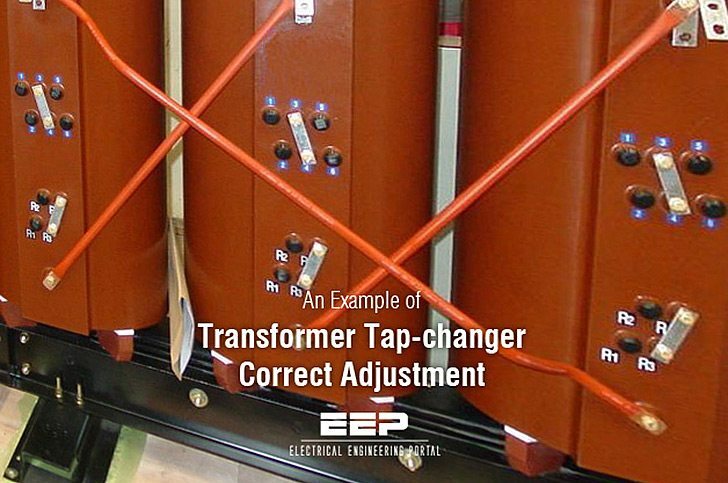 If the transformer in question had multiple taps on the output, we would select the tap closest to +2.7%. Since the secondary doesn’t have multiple taps, we’re stuck with 1/1.027 times as many windings as we’d like on the secondary, so the number of primary windings has to be reduced accordingly. Put another way, we want N2actual/N1actual = 1.027*N2nominal/N1nominal, and we’re constrained by N2actual=N2nominal. Solving this system of equations for the ratio of actual to nominal primary windings yields N1actual/N1nominal = 1/1.027. What would be th off-nominal transformation ratio of the transformer shown in the example?